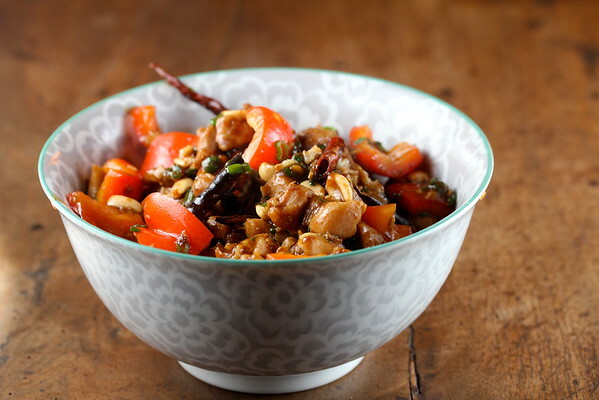 Kung Pao Chicken is one of my all time favorite stir fries, and this is the absolute best version I have tried so far. I love the underlying heat and, of course, the peanuts. This is not take-out Kung Pao Chicken. This is fine dining Kung Pao Chicken. The ingredient list is huge, but the melding of all of the flavors is key to the deliciousness of the dish. Hint number one for making this: Read the recipe all of the way through before preparing. Hint number two: Write out each step in large print with the timing next to each step. Trust me. This will save you when you are furiously stir-frying. Hint number three: Mise en place. The cooking time is only about three or four minutes. Follow the Boy Scout motto. "Be Prepared." Hint number 4: Clean up everything except your mise en place bowls before beginning to stir fry. You will enjoy your meal so much more. The specialty ingredients included in this recipe include dark soy sauce and Szechuan peppercorns. I found the dark soy sauce in my local Asian grocery store, but you can find it online as well. The peppercorns are actually berries, not pepper, which add a subtle peppery heat. You can also find these at an Asian market, but if you have a Penzey's Spices nearby, you can find them there too. For the dried chiles, I used Chiles de Arbol. We had this with steamed rice, and it was delicious. If you are nervous about stir-frying, Grace Young, wokker extraordinaire, has a Craftsy Course which includes a demonstration on how to make this dish. All of her ratings for the course are 5 stars! Adapted from Grace Young's Stir Frying to the Sky's Edge. There is also a wonderful Kung Pao Chicken in her book, The Breath of a Wok. Combine the first five ingredients in a medium bowl, plus the 1 tsp of rice wine/sherry. Add 1 tsp of the sugar, 1/2 tsp of the salt, and the water. Stir to completely coat the chicken pieces. In a small bowl or cup, combine the broth, vinegar, dark soy sauce, and sesame oil. Add the remaining tablespoon of rice wine/sherry. Heat the wok over high heat until a drop of water, when added, vaporizes immediately. Add 1 tablespoon of the oil and swirl it around. Add the chiles and peppercorns and stir for 15 seconds. Push the mixture to the side. Add the chicken and spread it out into an even layer. let it cook, undisturbed, for 1 minutes. Stir fry the chicken and chile mixture for 1 minute. Add the remaining liquid mixture. Stir fry for 1 more minute. The chicken should be just cooked at this point. Add the peanuts, scallions, the rest of the sugar and salt, and stir fry for about 30 seconds. This serves 2 to 4, depending how many courses you are serving. For even more amazing stir fries, I highly recommend these books linked below. Disclosure: If you purchase something from Amazon via a link on this site or on my Amazon Store, I may receive a very small commission in Amazon store credit at no extra charge to you. Unless otherwise stated, I personally purchased, own, use, and recommend the items in my Amazon store. Looks super yummy and so easy to prepare! Thanks Medeja! The prep takes some time, but the stir-fry take minutes! 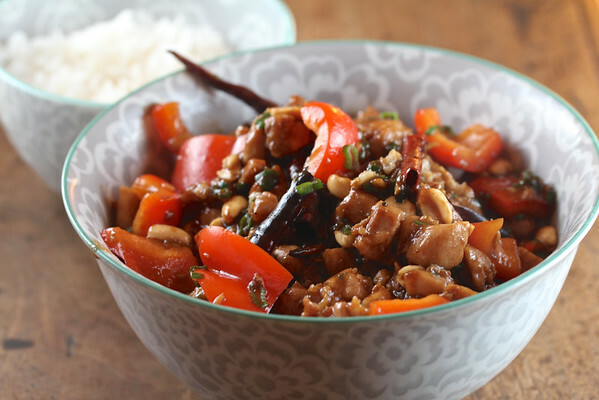 I absolutely LOVE Kung Pao Chicken but have never attempted it at home - Cannot wait to try it - Pinned! Oh thanks so much Gwen!! I made it from scratch twice, loooong time ago. Time to re-visit!